Strappy top Aria (lilac), lined with a lilac cotton fabric. The top has a satin gloss finish and is decorated with crotcheted lace along the neckline and the hem. The top is a little longer at the back and slightly rounded towards the hem. The straps are not adjustable. 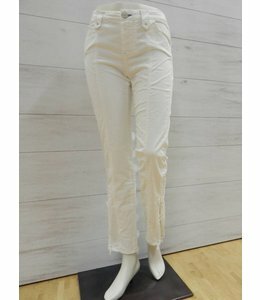 Trousers Bianco (weiss) with tailored waistband and belt loops, made from a stretchy cotton fabric.